For quantitative determination of free and total sialic acid (NANA) and evaluation of drug effects on sialic acid. • Sensitive and accurate. Use as little as 60 μL samples. Linear detection range in 96-well plate: 5 to 1000 μM sialic acid for colorimetric assays and 0.5 to 100 μM for fluorimetric assays. SIALIC ACID is a general name for nine carbon acidic sugars with N- or O-substituted derivatives. The most common member of these sugars is N-acetylneuraminic acid (NANA). Sialic acid is widely distributed throughout mammalian tissues and fluids including serum. Sialylated oligosaccharides have been shown to exhibit antiviral properties and are also known to influence blood coagulation and cholesterol levels. The sialic acid level in body fluids is also an important marker for diagnosing cancer. Simple and direct procedures for measuring sialic acid concentrations find wide applications in research and drug discovery. 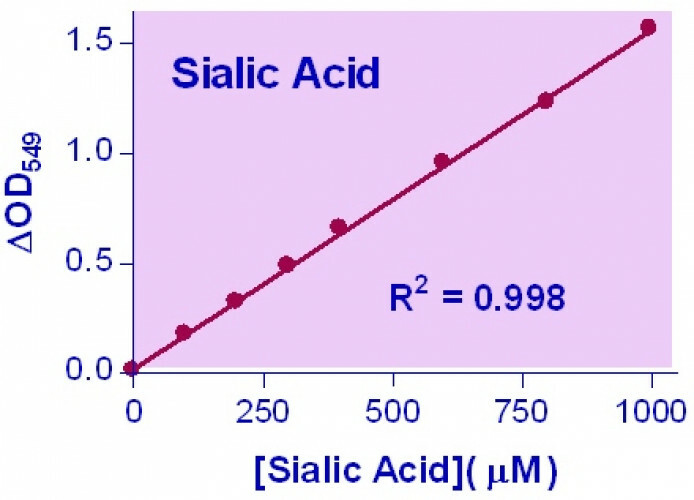 BioAssay Systems’ sialic acid assay uses an improved Warren method, in which sialic acid is oxidized to formylpyruvic acid which reacts with thiobarbituric acid to form a pink colored product. The color intensity at 549 nm or fluorescence intensity at λex/em = 555/585 nm is directly proportional to sialic acid concentration in the sample. Applications For quantitative determination of free and total sialic acid (NANA) and evaluation of drug effects on sialic acid. References Assay: Sialic Acid in Human blood (Pubmed). 2. Chrostek, L et al (2013). Sialic acid levels reflects the disturbances of glycosylation and acute-phase reaction in rheumatic diseases. Rheumatology International. 34(3): 393-399. Assay: Serum in Humans (Pubmed). 3. Pawluczyk, I. Z., Ghaderi Najafabadi, M., Patel, S., Desai, P., Vashi, D., Saleem, M. A., & Topham, P. S. (2014). Sialic acid attenuates puromycin aminonucleoside-induced desialylation and oxidative stress in human podocytes. Experimental cell research 320(2): 258-268. Assay: Sialic Acid in Human podocyte (Pubmed). 4. Gantner, M et all (2014). Partial synthesis of ganglioside and lysoganglioside lipoforms as internal standards for MS quantification. Journal of Lipid Research. 55, 2692-2704. Assay: Brain Gangliosides in Bovines (Pubmed). 5. Taib, I.S. et al. (2015) "Palm oil tocotrienol-rich fraction attenuates testicular toxicity induced by fenitrothion via an oxidative stress mechanism." Toxicology Research 4.1: 132-142. Assay: Sialic Acid in Rat tissue. 1. Carvalho FA et al (2011). Variations on fibrinogen-erythrocyte interactions during cell aging. PLoS One. 6(3):e18167. 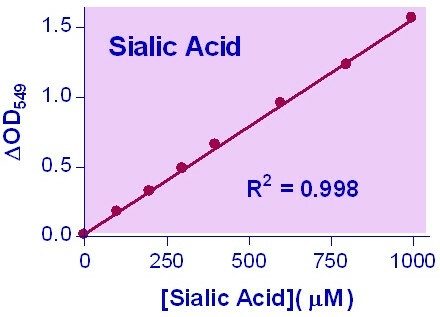 Assay: Sialic Acid in Human blood (Pubmed).